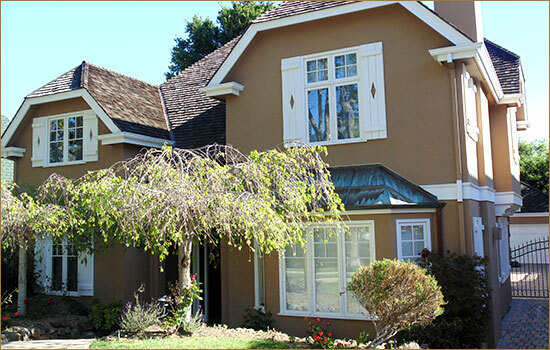 De Martini/Arnott Painting Company is responsible for some of the most beautiful home and building exteriors throughout the Bay Area. Their craftsmanship, color, finish expertise and attention to detail bring the “wow factor” to any exterior. We provide exterior house painting services with the highest level of professionalism, customer service and competitive pricing. We also offer a 5 year warranty on all exterior work! Because most exterior home painting in the Bay Area requires access to neighboring property, De Martini/Arnott will list neighbors as additional insureds on their policy. They provide the same level of courtesy and respect to those living around the work site and their property as they do to their customers. It is not uncommon to have a neighboring property owner hire De Martini/Arnott after observing the service, professionalism and artistry they bring to every job. What kind of help do you provide in choosing colors? When we do the initial color consult, we bring color charts from all of the high-end brands we use so clients can see the various choices and combinations. We can make recommendations on colors, gloss levels, paint type—pretty much anything that will result in an ideal outcome. We also do custom tinting. If a client wants to see the color on the walls, we will provide brush outs. What do I need to do to prepare for exterior painting? All we ask is that clients remove things such as stacked firewood or anything else that is up against the home or building. We can move other items and will provide protection around the affected area. Once we are finished, we will clean up, wash windows and return the surrounding area to tip top shape. How do your prep exterior surfaces for painting? De Martini/Arnott will begin your exterior painting project by cleaning surfaces to kill mold and mildew and create the optimal conditions for a flawless finish. Depending on the surface type and time of year, paint removal and prep work is completed using high heat, chemical stripping and/or electric sanding. How do you handle the rainy weather in this area? We don’t paint exteriors when it’s raining, but oftentimes we can move indoors if we’re doing both inside and outside painting. When we’re doing prep work, we only prep as much as we know can be safely painted if there’s any possibility of rain. There are also a number of quick drying finishes that dry in a couple of hours and that can be applied in temperatures as low as 38 degrees. Can you paint any surface such as stucco, vinyl siding or brick? Yes. We don’t recommend painting prefinished anodized metal, but most other surfaces can be successfully painted. We’ve done some pretty interesting work on garage floors, adding things like sprinkles into the epoxy. Do you work on historic buildings? Yes, we do. We’ve helped restore buildings to match the original paint colors. We have worked with architects and designers to make sure we are producing an accurate representation and returning buildings to their former glory.